Just a year shy of his first neonatal intensive care unit (NICU) stay as a newborn, Taylor VanOrden celebrated his first birthday in a hospital gown. Taylor, who lives with his family in Blackfoot, ID, is a fun, spunky, energetic, and determined little boy who was diagnosed with cystic fibrosis when he was less than a week old. According to the Cystic Fibrosis Foundation (CFF), today, approximately 30,000 people in the United States have cystic fibrosis, which is a rare genetic disease that causes severe damage to the lungs and digestive system. Taylor spent two weeks in the NICU, and during that time, a sweat test confirmed that he had cystic fibrosis. 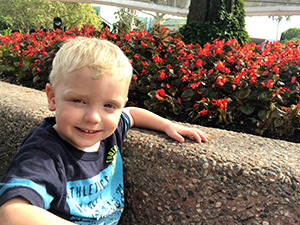 Since then, the now four-year-old has relied on a variety of medications and vitamins every day as well as treatments to clear sticky mucus from his lungs. Every year for the last four years, Taylor has had to visit his doctor at Primary Children’s in Salt Lake City every three months to check that he’s healthy. And once a year he’s admitted to the hospital for two weeks to have bloodwork taken, a lung exam, and a hospital clean out of his lungs. On a daily basis, Taylor takes over 12 different inhaled and oral medications to help manage his disease of cystic fibrosis. He also wears a percussion vest for one to two hours every day to help break up the mucus in his lungs. Books and pamphlets with pictures of other kids with cystic fibrosis wearing a percussion vest have been an invaluable tool for the VanOrden family. They can show these to Taylor so he knows there are other kids doing what he has to do every day too. Cystic fibrosis also affects the pancreas because the buildup of mucus prevents the release of digestive enzymes that allow the body to break down food and absorb vital nutrients. This can result in malnourishment, poor growth, brittle bones, and difficulty gaining weight, despite a healthy appetite. Some of the medications he takes help to ensure he’s absorbing all of the nutrients from the foods he eats to prevent these things from happening. Taylor’s diagnosis has helped the VanOrden family to be more present, really focus on and celebrate the small milestones in their lives, and be grateful for every moment and everything they have. The monetary donations to support cystic fibrosis research 20-plus-years ago have paved the way for Taylor (and so many others!) to have a fulfilling childhood and thrive as adults. Now, because of studies and new medications, the life expectancy for those with cystic fibrosis is in the mid-40s, and with new treatments and medications, the hope is the life expectancy will become even longer. Taylor’s parents have recognized how important it is to increase awareness and support cystic fibrosis research to give others the chance for a brighter future. That’s why the VanOrden family will participate in the Wolverine Canyon Marathon this year. All of the proceeds from the Wolverine Canyon Marathon will go to charitable foundations. Fifty percent will go to the Blackfoot Rotary Club and the Bingham Health Care Foundation, and 50 percent will go towards Taylor’s medical expenses.